The art of conversation, once considered the sign of a civilized individual, seems less common today. Yet we count the pleasures of sharing experiences, collecting news, and exchanging ideas one of the pleasures of life. These natural conversations provide information, encouragement, and pleasure. Many people say that they are too busy to have long talks. Other people prefer to watch television, play computer games, or listen to the radio rather than talk to relatives and friends. Sometimes people feel too shy to speak to the people next to them. Many Americans, it seems to us, have forgotten how to hold good, deep conversations, or even a friendly chat with neighbors. We suspect this lack of real communication lessens their joy. Of course, people learning English as a second, third, or fourth language face even more barriers. English remains a strange, confusing, difficult, and misspelled language – and it’s easy to feel uncomfortable when speaking in this new tongue. That’s why Compelling Conversations includes short questions that lead to better conversations. We also show how to ask clarifying questions and more philosophical questions. Readers discover they create more meaningful conversations in English too. How do keep a conversation going? What is the word for ……? What vocabulary words do I need? How do show my agreement, or disagreement, in a lively, yet polite way? How can I share my experiences with a limited vocabulary? How else can I ask a question? How can I reduce the possibility of being misunderstood? How can I have better and more engaging conversations in English? Where can I practice my speaking skills in a safe, tolerant atmosphere? 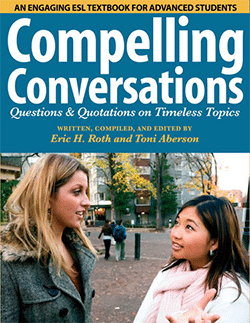 Single copies of Compelling Conversations - Vietnam: Speaking Exercises for Vietnamese Learners of Englishand Quotations on Timeless Topics are available directly from Chimayo Press with Paypal. Compelling Conversations is now available on your iPad! With purchase of the PDF, you have permission to make personal hard copies for you and your ESL/EFL students. You may not, however, make electronic copies or post on any website. 1. Purchase Compelling Conversations with Paypal and E-Junkie. 2. E-Junkie will redirect you, after you pay, to the Compelling Conversations thank you page. 3. Click on the "Download Compelling Conversations" link. 4. Download Compelling Conversations to your computer. If you have a problem after ordering and aren't redirected to the download page, just send us an email with your PayPal receipt.